Disney’s sci-fi adventure film “Tomorrowland” is off to a slow start in China, with early Tuesday numbers pointing to a box office debut of less $3 million. “Tomorrowland,” starring George Clooney, Hugh Laurie and Britt Robertson, topped the Memorial Day box office domestically over the weekend, but its four-day haul of $41 million was below the expectations of analysts and less than the studio had hoped for. 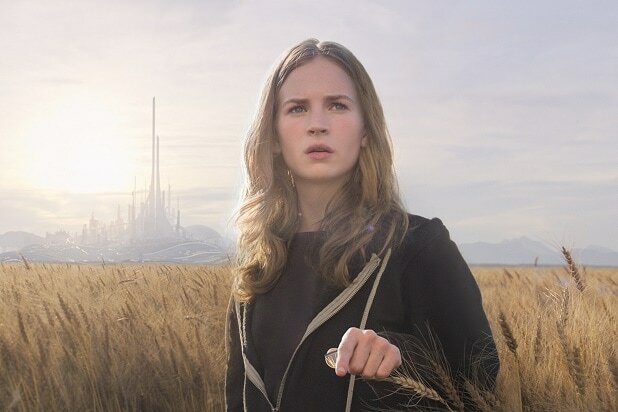 “Tomorrowland” will take in $2.6 million in its first day of release in China, according to projections from Chinese tracking service Entgroup posted by BoxOffice.com. By comparison, “Fast and Furious 7” took in a record-breaking $68 million on its first day in China theaters, though it came on a holiday Sunday and the tally included Saturday late shows. The stakes are high for Disney on “Tomorrowland,” an original sci-fi saga directed by Brad Bird and co-written by Damon Lindelof, given that the production budget was $180 million. The film brought in $26.7 million this weekend from 66 overseas territories — a little over half of its eventual rollout — putting its global total north of $68 million. “Tomorrowland” grossed $3.6 million in Russia and $2.8 million in Mexico, both No. 1 openings, and it debuted in the top spot in most Asian markets, including Hong Kong, Indonesia, Malaysia, Singapore and Thailand. Among the larger markets still to come are Spain, Australia, Japan, Korea and Brazil. The early numbers from China are not a good sign, especially since Hollywood sci-fi movies have done pretty well there of late. “Interstellar” earned a total of $122 million last year and “Gravity” took in $72 million in 2013. Even “Jupiter Ascending,” the pricy space opera from Andy and Lana Wachowski that failed to connect domestically, grossed $44 million in China earlier this year for Warner Bros. However, the Johnny Depp sci-fi saga “Transcendence” flopped there with just $20 million over the course of its 2014 run. Even if things don’t pick up for “Tomorrowland,” Disney will be able to content itself with the Chinese reception for “Avengers: Age of Ultron,” which crossed the $200 million mark there this weekend.